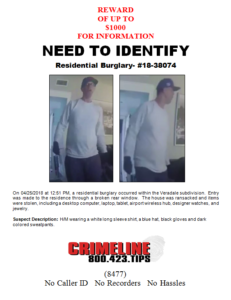 On 04/25/2018 at 12:51 PM, a residential burglary occurred within the Veradale subdivision. Entry was made to the residence through a broken rear window. The house was ransacked and items were stolen, including a desktop computer, laptop, tablet, airport wireless hub, designer watches, and jewelry. 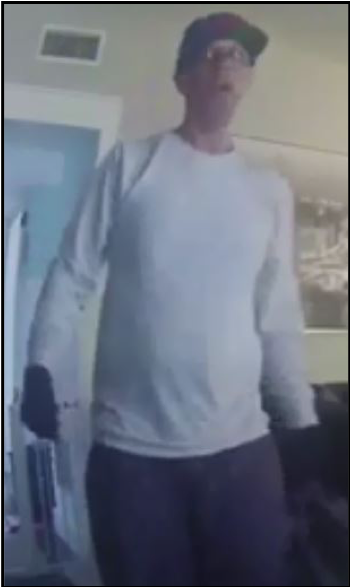 Suspect Description: H/M wearing a white long sleeve shirt, a blue hat, black gloves and dark colored sweatpants. If you know the whereabouts of the person, or details of the crime featured below, you may be eligible for a reward of up to $1000.